A later production Byte Shop-style Apple-1 computer. Would you pay close to a million dollars for a 42-year-old computer? That’s what it might take to win the auction next month of one of the rarest pieces of technology on the planet: one of the first 200 computers made by a company called Apple. Two Boston auction companies, RR Auction and Invaluable, are holding the auction of the Apple 1 computer, a piece of technology so crude it doesn’t come in a casing. Only 200 were ever made, and fewer than 80 survive. And this one still works. “It’s in a category all its own,” said Rob Weisberg, chief executive of Invaluable, an online auction service based in Allston. The auction is set for Sept. 25 at the WeWork co-working facility on Portland Street in Boston. But before you grab your checkbook, think of all the things the Apple 1 computer can’t do: send e-mail, play Fortnite, do your taxes, stream Netflix, or let you look at the photos from your summer vacation. In fact, about all the Apple 1 could do was play a passable game of checkers. That, and change the world. Apple cofounder Steve Wozniak designed the machine’s hardware and software in 1976. Then he and his best friend, Steve Jobs, assembled 200 of them. The money they made went into building their next model, the Apple 2, which was far more powerful and a lot more popular. Apple sold over five million of them. Those, too, are prized by collectors and sell on eBay for thousands of dollars. But with so few in circulation, Apple 1 computers go for a lot more. The Henry Ford Museum in Dearborn, Mich., paid $905,000 for one of them in 2014. The one being auctioned off in Boston is in exceptionally good condition. Corey Cohen, a consultant in vintage computer hardware, said that most of the surviving Apple 1’s were physically altered by their owners to improve their performance. Back in the day, there was no easy way to plug in extra memory chips, so owners would partially dismantle the main circuit board to squeeze in more. But not in the case of this particular Apple 1, which belongs to an unidentified academic living on the West Coast. “It’s one of the few examples where the board is intact,” Cohen said. He was hired by RR Auction to inspect the machine, and found it needed only a few minor repairs to put it back in full working order. The only thing missing is a case to protect its delicate electronics. The Apple 1 is basically a printed circuit board studded with chips. But that was the way Jobs and Wozniak sold their first machines. Early adopters built their own cases; one made out of wood was on display at the Smithsonian Institution for a time. Of course, a modern smartwatch could run rings around the ancient processor of the Apple 1. Apple sold only a handful of programs for it, including chess, checkers, and a desktop version of “Star Trek,” a text-based space warfare game popular with 1970s mainframe computer geeks. Software was stored on tapes, and slowly fed into the computer through a special interface with a cassette player. Or you could run programs by sitting at the keyboard and typing in the code, one line at a time. People did it, too; books and magazines stuffed with typeable software programs for the Apple 1 and its successors sold thousands of copies, and turned hobbyists into programmers by helping them learn to write code of their own. Invaluable is using the Apple 1 sale to roll out its own new technology, designed to ensure the authenticity of classic artworks and rare computers. It has partnered with Artmyn, a Swiss company that has developed a high-resolution scanning system capable of making a forgery-proof “fingerprint” of an object. “We are able to capture what we call the DNA of artwork,” said Artmyn chief executive Alexandre Catsicas. The scanner system uses an array of cameras to shoot thousands of images of an artwork, generating as much as a terabyte of data for each object. The images are then compressed and converted into a movie capable of showing the finest details. Artmyn can rescan the item years later and instantly detect any damage or alterations. 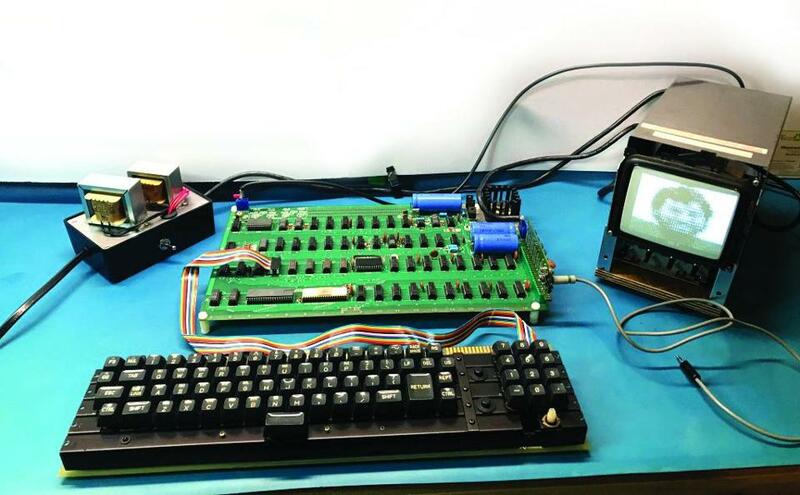 Invaluable has used the Artmyn system to scan the Apple 1 board. Invaluable will demonstrate the Artmyn scanning system and the vintage Apple 1 at the company’s headquarters on Sept. 5.